Whether you had braces as a teen but didn’t keep up with your retainers, or if you’ve always dealt with crooked teeth, you’ve got options for improving the alignment of your smile. Invisalign is the clear braces system for adults just like you! Using a series of clear plastic aligners, Invisalign gradually shifts teeth into the preferred position over a period of one year, on average. The aligners are custom fit to meet your unique orthodontic needs. You’ll receive your entire treatment kit in the mail and you can begin treatment immediately, advancing through the system with a new tray approximately every two weeks. Visit Horsham Dental every six weeks for a checkup with Dr. Henkel to make sure everything is going like it should, and you’ll be flashing your new, improved smile before you know it. Chances are good no one will ever notice you’re undergoing orthodontic treatment with the clear Invisalign aligners. Removable trays make it easy to keep living your life without diet restrictions or the stress you’ve got something stuck in your braces. Keep brushing and flossing like you’re used to by removing your aligners for excellent oral hygiene. 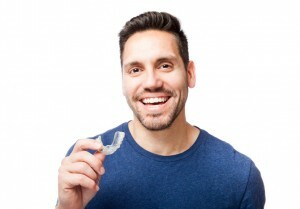 Invisalign offers a shorter average treatment time than traditional braces. With fewer trips to the dentist necessary than with traditional braces, you spend less time thinking about and planning for your orthodontic treatment. Smooth, plastic aligners will never rub a blister in your delicate cheeks, gums, tongue or lips. And once you’ve completed your orthodontic treatment, you’ll see that having a properly-aligned bite is about more than just the cosmetic. Straight teeth make it easier for you to brush and floss effectively, so your dental health can improve with orthodontic treatment. Additionally, many patients experiencing jaw pain due to a misaligned bite finally find the relief they’ve been seeking after their treatment with adult braces. Learn More About Clear Braces in Philadelphia Today! Good candidates for Invisalign are adults and older teens in good oral and dental health who are interested in achieving straighter teeth without metal brackets and wires. Would you like to learn more about the Invisalign treatment? Contact Horsham Dental Elements to request your appointment to discuss adult orthodontics in Philadelphia today!